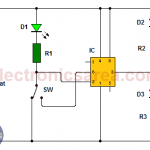 This ON-OFF Switch circuit using a 555 timer is simple, useful and easy to implement. This circuit has many applications on places where it is necessary to activate and deactivate (connect and disconnect) an electrical or electronic device. How the ON-OFF Switch circuit works? This ON-OFF Switch circuit uses the known 555 timer. The timer activates a relay through a bipolar transistor in order to connect or disconnect the device we want to control. Manual activation is performed through two momentary contact switches. Switch 1 (SW1) is used to enable and Switch 2 (SW2) is used to disable the device. The voltage on pin 2 of timer 555, change sharply from 12 V to 0 volts. (triggers the 555). The timer output (pin 3) passes to a nearby 12-volt voltage. To deactivate the relay (and disable the device we want to control) switch 2 (SW2) is pressed. When the switch 2 is pressed the voltage on pin 6 of the 555 timer changes temporarily to 12 volts. The output of the 555 (pin 3) will have a voltage close to 0 volts, the transistor will be in its cutoff region, and the relay will be disabled. The next two diagrams show the proposed PCB for this circuit and an image of what would be the finished circuit. On the last diagram we see two connections made by the component side (blue). To see them well, you only need to expand a little the diagram. Note: The circuit works well in a range of 5 to 15 volts. You can use a 9 volt battery so you have a portable circuit. I do not see a reason, why the resistor has burned. Check the circuit that you put together and try again. The resistor has a value of 3.3M. When the circuit is working on 9 vdc (SMPS) adapter, and another mains switches in the same room are operated the circuit automatically became ON ( i. e. without touching any part of the circuit). It seems to me that there is a peak voltage that causes the circuit to activate. Place a 10 uF electrolytic capacitor between the terminals of the 9 volt source. I hope it works well.